Cars are one of my favorite photography subjects, the lines and angles, colors, shapes, all present challenges. Lens choice completely changes the look of a car too, one reason I love the 16-35mm wide angle is that I can get right up on a hood ornament. Old cars represent a piece of Americana, a time when products were built to last a lifetime. Just take a look at any hood ornament and grill from the 1960’s or earlier, that one part of the car represented what the auto maker wanted you to think about the entire car and the company itself! These car photos have something in common, their manufacturers all went out of business – defunct. I find most of these at car shows but have also found them sitting on the streets, sometimes unrestored. The above photo, titled Transtar, is the grill of a 1956 Studebaker Transtar pickup. If I could make a living shooting car grills and hood ornaments, I’d do it in a minute because all have their own identity. The Studebaker Brothers Manufacturing Company was based in Southbend, Indiana and while it survived the Great Depression, it couldn’t survive the sixties; Studebaker went under in March 1966. (1) The Studebaker Transtar was produced from 1956-1958 and 1960-1963 in 1/2-ton, 3/4-ton, 1-ton, 2-ton, and even 2-ton heavy duty models. The Transtar name was eventually dropped and replaced with the Champ. 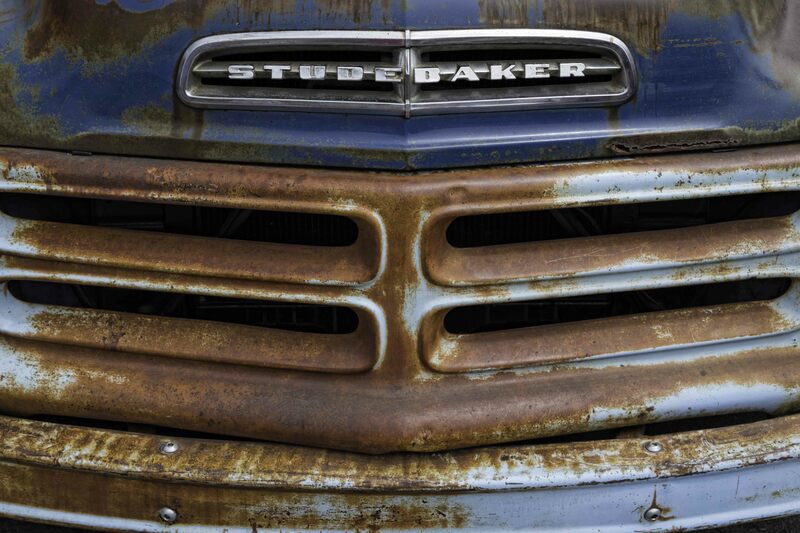 Studebaker closed its US truck factories in December of 1963. (2) One interesting side note, the wagons pulled by the Budweiser Clydesdales are “Studebaker wagons (circa 1900) that were converted to deliver beer.”(3) Transtar was shot with a Canon 6D, EF 24-105mm f/4 L IS USM lens at f/8, 1/100 sec, focal length 60mm, and ISO 100. This photo, called Sportsman, is the reflection of a 1959 Cadillac on the side of a 1959 DeSoto Sportsman that I found sitting in downtown San Diego. I wanted to capture these two classic cars at one time but keep the focus on the DeSoto Sportsman. The DeSoto make was introduced in 1929 by Chrysler to compete with the competitor’s mid-priced line of cars. The DeSoto brand was the lower priced version of Chrysler cars. (4) By 1960, Chrysler had “plans to modern DeSoto’s styling and image” but this was negated when “production came to a halt November 30, 1960. Dealers were notified by telegram.”(5) Sportsman was shot with a Canon 6D, EF 16-35mm f/4 L IS USM lens at f/5, 1/80 sec, focal length of 31mm, and ISO 100. On the right is the the dash and interior of an unrestored 1953 Hudson Hornet with the twin-H engine. In my opinion, this is one of the coolest cars to come out of Detroit, period. The Hudson Motor Car Co. was in business from 1909 to 1954. Hudson merged with the Nash-Kelvinator Corp. to become American Motors (AMC) and the last Hudson rolled off the line in 1957. The Hudson Hornet was produced by Hudson from 1951-54 and by AMC from 1955-57. (6) The Hornet featured a “step-down” design with a dropped floorpan, chassis, and lowered center of gravity making it ideal for racing. (7) Hudson Motors was the very first automobile manufacturer that got involved with stock car racing. (8) They “dominated stock car racing in the early-1950s, when stock car racers actually raced stock cars.”(9) This photo, Hudson Hornet Dash, was shot with a Canon 6D, EF 16-35mm f/4 L IS USM lens at f/8.0, 1/15 sec, focal length of 18mm, and ISO 100. Sometimes these cars are even cooler when unrestored. This is a 1935 Auburn Boat Tail Speedster, the Auburn Automobile Company of Auburn, Indiana began in 1874 and was “modestly successful until material shortages during World War I forced the plant to close.” In 1919, the company was sold and was only barely successful until it was forced to close its doors during the Great Depression in 1937. (10) These 2930’s cars are incredibly impressive and beautiful in every way, not to mention they could hold 100mph! This photo, Boat Tail Speedster was shot with a Canon 6D, EF 24-105mm f/4 L IS USM lens at f/4.0, 1/400 sec, focal length of 24mm, and ISO 100. The below photo, Woody, is a 1949 Oldsmobile Woody Wagon, a very cool car. I can’t help but think of Jan and Dean or Beachboy tunes just looking at this ride! Oldsmobiles were produced for most of their existence by General Motors and it’s hard to believe they were around from 1897-2004. In those 107 years, Oldsmobile “produced 35.2 million cars” and when phased out in 2004 “was the oldest surviving American automobile” brand. (11) Oldsmobile was not the only company to make the “Woody” body style, they were also produced by Ford, Chrysler, Nash, and Pontiac to name a few. I wanted to shoot this car capturing wood sides that made it famous plus the owner’s preseutation from the back was really cool at this car show in Pacific Beach, CA. Woody was shot with a Canon 6D, EF 24-105mm f/4 L IS USM lens at f/8.0, 1/80 sec, focal length of 24mm, and ISO 100. 1. Johnson, Dale (March 4, 2006). “(Copy of)The last days of Studebaker“. The Toronto Star. Archived from the original. 2. Wikipedia, Studebaker Transtar, 2016, https://en.wikipedia.org/wiki/Studebaker_Transtar (accessed February 23, 2016). 3. “Clydesdales”. Archived from the original on 2009-05-09. Retrieved February 2, 2013. 4. Kimes, Beverly (1996). standard catalog of American Cars 1805-1942. Krause publications. ISBN 0-87341-428-4. 5. AllPar, A Full History of Desoto, 2016, http://www.allpar.com/history/desoto.html (accessed February 23, 2016). 6. Wikipedia, Hudson Motor Car Company, 2016, https://en.wikipedia.org/wiki/Hudson_Motor_Car_Company (accessed February 23, 2016). 7. “1954 Hudson Hornet Club Coupe”. Popular Mechanics. April 1999. Archived from the original on 22 April 2009. Retrieved 16 May 2015. 8. Cheptea, Constantin (24 June 2006). “1952 Hudson Hornet”. TopSpeed. Retrieved 16 May 2015. 9. Nerad, Jack. “Hudson Hornet (and racing) — as seen in Pixar’s movie Cars”. Driving Today. Retrieved 16 May 2015. 10. Wikipedia, Auburn Automobile, 2016, https://en.wikipedia.org/wiki/Auburn_Automobile (accessed February 23, 2016). 11. Wikipedia, Oldsmobile, 2016, https://en.wikipedia.org/wiki/Oldsmobile (accessed February 23, 2016).